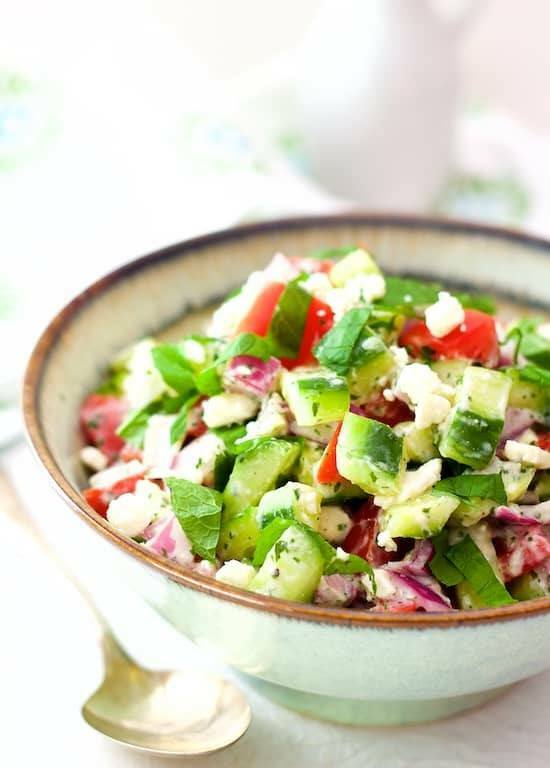 Cucumber Tomato and Red Onion Salad with Yogurt Mint Dressing and Feta Cheese is the perfect side dish for grilled meat, poultry or fish. Combine chopped cucumber, tomatoes and red onion in a bowl. Set aside. Combine yogurt, garlic, lemon, mint, and salt and black pepper in a mini food processor or blender. Process until smooth. Pour over vegetables, add feta cheese and toss. Garnish with thinly sliced mint leaves and serve immediately.